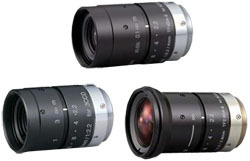 Fujinon offers many models of compact, lightweight, high-resolution, low-distortion lenses including those with coverage of 6 to 75 mm suitable for cameras of up to 1.5 megapixels and 185-degree omnidirectional fish-eye lenses suitable with cameras of up to 5 megapixels. High-resolution design provides support for up to 1.5 megapixel camera resolution. 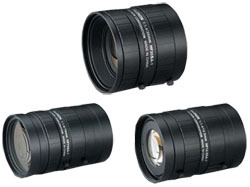 Rear focusing system provides improved performance in macro photography. Wide-aperture design achieves clear images under low light intensity. Low-distortion design achieving accurate image input. Robust enclosure resistant to vibrations and shocks. Equipped with locking knobs for the iris and the focus. 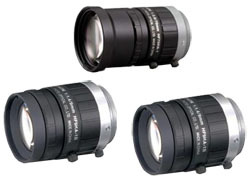 These lenses are designed to achieve high-resolution, supporting up to 1.5 megapixel cameras. Designed for low distortion, enabling faithful image input. Compact, lightweight and robust design, supporting various systems. Focus & iris lock tab provided, supporting environments such as vibration. A special design optimizes the image quality of 3CCD cameras. Low-distortion design achieving accurate image input. Compact, lightweight and robust design, supporting various systems. Faithful color reproduction for 3CCD cameras, best suited for advanced monitoring applications. A high-resolution design provides support for up to 5 megapixel camera resolution. The rear focusing system provides improved performance in macro photography. Wide-aperture (F1.4) design achieves clear images under low light intensity. Enhanced image recognition accuracy achieved by reduction of distortion and improvement of illumination uniformity. Robust enclosure resistant to vibrations and shocks. Equipped with locking knobs for the iris and the focus. The high resolution design supports up to 1.5 megapixel cameras. Designed for low distortion, enabling faithful image input. Compact, lightweight and robust design, supporting various systems. Focus & iris lock tab provided, supporting environments such as vibration. Advanced Control Solutions is a Fujinon distributor in Georgia, Tennessee, Alabama and Mississippi. We offer free evaluations and technical support to help our customers solve their applications.